UPS terminates Jacksonville, FL Teamster union steward | Fight Back! Jacksonville, FL – As the expiration date for the Teamsters-UPS national master agreement rapidly approaches, UPS management has moved to crack down on union activists fighting for a better contract. 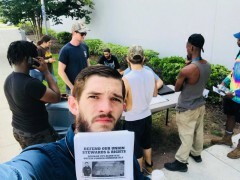 On June 8, the company terminated Dustin Ponder, a union steward at UPS in Jacksonville, Florida, elected earlier this year. His activity and involvement in the 2018 contract battle and last month’s strike authorization vote have many Teamsters believing this is a case of management retaliation. UPS terminated Ponder for alleged “dishonesty” - a cardinal offense, according to the UPS contract - though management has yet to substantiate any instance of dishonesty by the Jacksonville union steward. Terrence Thomas, the UPS division manager for the Jacksonville River City day sort, terminated Ponder, providing no further clarification for the discipline in a certified letter sent to his home several days later. The termination came just days after Ponder filed six grievances over instances of management harassment and rampant safety violations. Ponder had just assumed his duties as the newly elected chief union steward of his shift days earlier. In the days that followed, UPS Teamster leaders in Jacksonville gathered at Ponder’s workplace, UPS’s new ‘River City hub’, to collect petitions from coworkers. About 70 UPS workers on the River City day sort – Ponder’s shift – signed the petition, and no worker who was asked to sign refused. Dustin Ponder, age 30, has worked at UPS and actively organized in his union, the Teamsters, for nearly eight years. Back in March, he was elected by his coworkers as chief steward for the UPS River City day sort operation. He’s the co-host of a popular labor podcast, the Worker Power Hour, which has picked up a following amongst fighting Teamsters and union members across the country. Coworkers on the River City day sort say Ponder is known for filing grievances – more than 50 in 2018 alone, many addressing safety and harassment concerns – and educating members on their rights. Across the state of Florida, he is known by Teamsters as one of the most active leaders of the Teamsters United movement, playing a key role in the reform movement’s victory in the 2016 International Brotherhood of Teamsters elections in the Southern Region. Earlier in June, 93.18% of the UPS Teamsters voted to give the union’s national negotiating committee authorization to call a strike in their contract negotiations with UPS, which are ongoing. The Teamsters-UPS contract is the largest collective bargaining agreement in the U.S. private sector, encompassing more than 230,000 workers. The agreement is set for expiration on July 31, 2018. Ponder’s case has attracted the outrage of Teamsters across the country familiar with UPS’s attacks on militant workplace leaders. Atkinson fought a high-profile, national retaliation case against UPS several years ago when he was terminated for union activity. Dave Schneider is a UPS Teamster and a union steward for Teamsters Local 512 in Jacksonville, Florida.